Home › History › Ken Wiles joins Silver Laughter and makes us better! Ken Wiles joins Silver Laughter and makes us better! Some of the clubs required bands to wear matching outfits. Here are Mick, Mark, Kim and Jon with our Beatles “Your Mother Should Know” look. 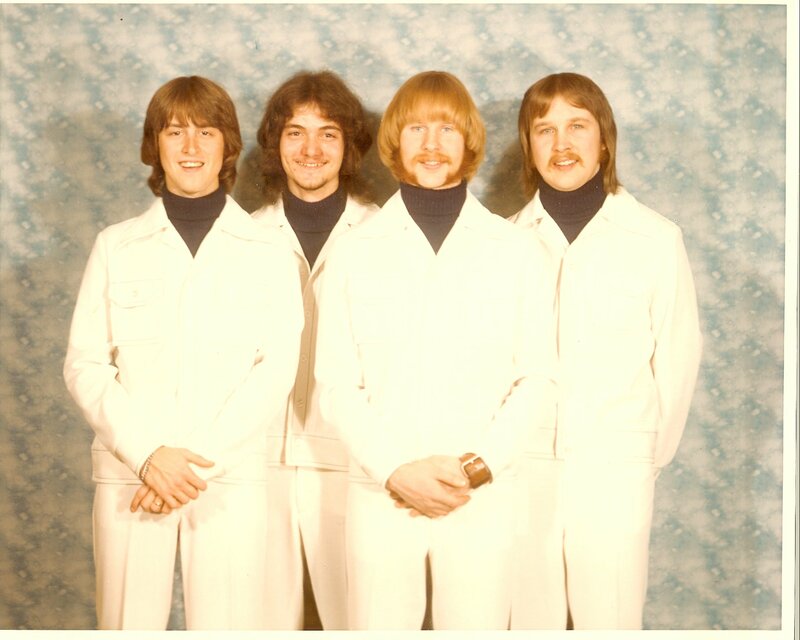 During this period, some club owners had a matching outfit requirement of all their bands. We decided on this look as being one of the better “cop-outs” to the corporate establishment! Mark Zaputil was with us when this picture was taken at the Ludtke home by Jon and Kim’s dad. But shortly after that Mark decided touring was not for him. I am not sure how we got this picture which looks like we are all the same height, however, Jon was much taller than the rest of us. Later on I wore platform boots (which were popular during the disco era) for performing. These made me closer to Jon and Ken in height on stage. Both of them were over 6′. Once again, matching suits. Here is an autographed photo from that era. Pictured here are Mick, Jon, Ken and Kim. When Mark announced his “2 week notice”, we started looking for a replacement lead guitarist. Dave Neumann of my old Davenport/Colorado group, Tabernash (formerly The Contents Are:), was a consideration. However, we met Ken Wiles on one of our nights off in a club (Ken says he thinks we were playing and on a break… he is probably right. I tried to reach Jon to verify this, but got his voice mail) called the Cavern. It was under a parking lot and made to look like a cave. Very cool at the time. I was against it at first because… he was too tall. Silver Laughter was going for a Beatles look and having someone that much taller than us threw off the proportions! Besides, I had played with Dave for a few years before joining the group so I was more inclined to know how to work with him. Ken Wiles was not a total stranger to us, however. During high school, Jon, Ken and I all worked at a department store in Davenport, Iowa and talked music all the time. Jon and I had been in a high school band called “Assassination of Sound” while Ken was with a much more “famous” group called Morninglight. They fashioned themselves much like the Who. But not long before we met him at the Cavern, Ken had been playing in a “show” band (dance steps and female singers!) so he knew a lot about stage presence. Jon finally won the argument (as he usually did), and Ken became our lead guitarist. Looking back, I would not have had it any other way. It was one of the best steps to taking Silver Laughter to the next level.